Ahead of a major United Nations conference on landlocked development countries (LLDCs) set for later this year, delegates at a high-level meeting in Mongolia have called for the immediate ratification of an agreement which will help boost trade and make it easier for these countries to participate competitively in global markets. Trade facilitation measures are of critical importance for LLDCs and their coastal neighbours in order to ensure quicker, easier and less costly transactions, said Gyan Chandra Acharya, High Representative for the Least Developed Countries, Landlocked Developing Countries and Small Island Developing States and Secretary-General of the Second UN Conference on Landlocked Developing Countries to be held in November in Vienna. As we prepare for the Vienna conference, it is clear that we need to identify a development framework for LLDCs that can truly help them achieve rapid, inclusive and sustainable economic growth, he added. The two-day meeting in Mongolias capital of Ulaanbaatar assessed how LLDCs can benefit from the World Trade Organizations new agreement on trade facilitation, a mechanism which simplifies and streamlines the procedures and controls that govern the movement of goods across borders. High trading costs are a critical challenge for LLDCs striving to improve their participation in international trade. Compared to countries with access to sea ports, LLDCs currently pay more than double in transport costs and incur significant time delays in sending and receiving merchandise overseas. The Trade Facilitation Agreement, which will enter into force once it is ratified by two-thirds of WTOs members, seeks to drive customs efficiency, lower trade costs, and reduce delays at border crossings. Enhanced trade facilitation is also likely to increase the flow of foreign direct investment and enhance economic development. There are 32 countries classified as landlocked developing, 16 of which are located in Africa, 10 in Asia, 4 in Europe and 2 in Latin America. In addition to trade facilitation, other issues of crucial importance to LLDCs include infrastructure financing, the impact of climate change, desertification, and information and communication development. 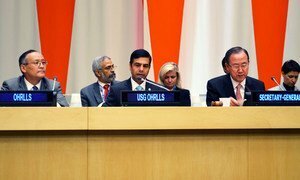 United Nations Under Secretary-General Gyan Chandra Acharya has welcomed the adoption of resolution calling for the active participation of all Member States in the Second UN Conference on Landlocked Developing Countries (LLDC), set to take place from 3-5 November 2014, in Vienna.